Watch Paul Williams, Daft Punk, Nile Rodgers and Pharrell Williams accept the Album Of The Year GRAMMY on the 56th Annual GRAMMY Awards on Jan. 26 in Los Angeles! 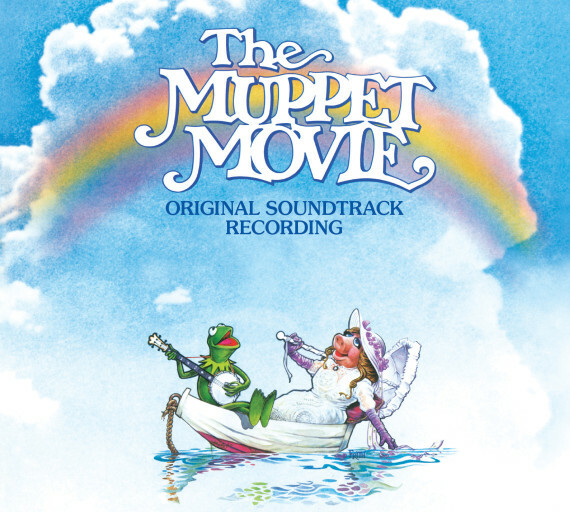 The Rainbow Connection is going digital, as Walt Disney Records celebrates the upcoming 35th Anniversary of the classic frogs-to-riches story, “The Muppet Movie,” with the re-release of its Grammy-winning soundtrack album. Originally produced by Paul Williams and executive produced by late Muppet creator Jim Henson, the album features eleven timeless songs by Williams and Kenny Ascher. The release, for the first time in both digital and physical formats, coincides with the Blu-ray™ release of the classic 1979 film. Featuring new liner notes by Oscar® and Grammy®-winning composer Paul Williams, the album arrives in stores and at online retailers August 13. From the opening strum of Kermit the frogs banjo on “The Rainbow Connection” (a 1979 Oscar nominee for Best Original Song) to the dazzling Hollywood sound stage finale featuring the entire Muppet cast singing “The Magic Store,” the songs of “The Muppet Movie” make up the most memorable movie score ever written for a frog, pig, dog and whatever The Great Gonzo is. As Williams writes in his liner notes, Henson set out to not make a children’s film but rather one “for the child in all of us.” The Muppets creator gave Williams and Ascher total freedom to write songs they felt suited the story and characters. That they did with tunes like Kermit’s touching and world renowned “Rainbow Connection,” Miss Piggy’s dulcet “Never Before, Never Again” (the sweetest pig-frog love song ever) and the rockin’ “Can You Picture That” by the legendary band, The Electric Mayhem, featuring Animal on drums. Watch Paul Williams and Tracey Jackson speaking at the 140 Characters Conference on the topic: Something Needs To Change And It’s Probably Me. 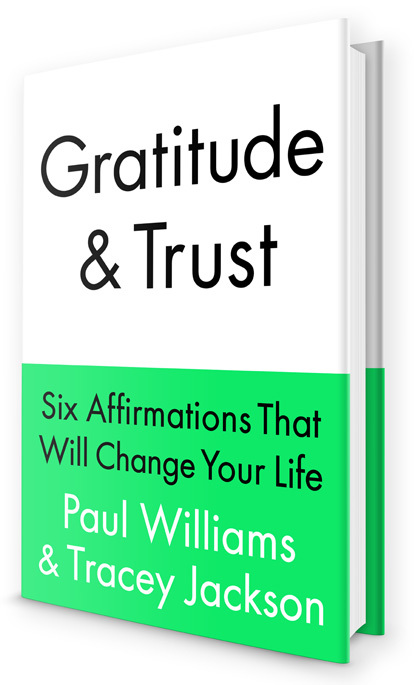 Visit gratitudeandtrust.com to read Paul and Tracey’s blog on topics related to this talk. What’s it like to record with robots? “They were really amazingly easy to work with,” says the veteran songwriter and current ASCAP president of the breathlessly hyped French electronic duo. His rich legacy was not lost on French electronic duo Daft Punk, who recruited the 72-year-old to contribute lyrics and vocals to “Touch” and “Beyond,” two tracks on their breathlessly hyped No. 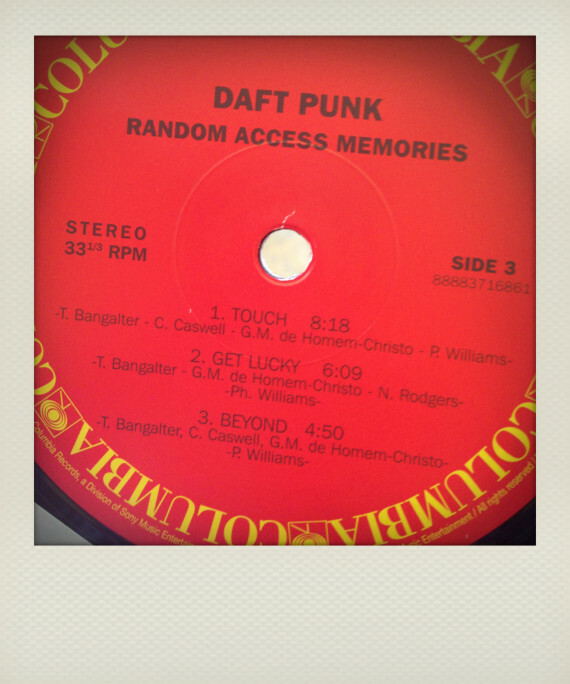 1 album Random Access Memories. 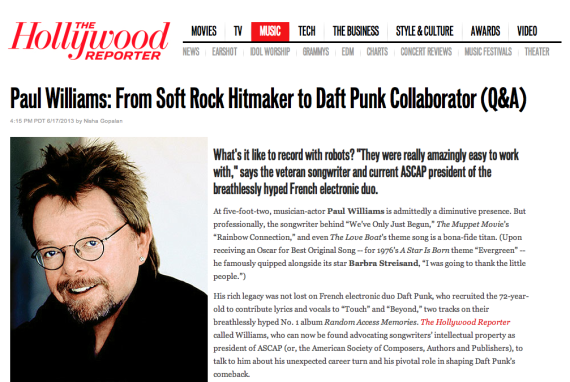 The Hollywood Reporter called Williams, who can now be found advocating songwriters’ intellectual property as president of ASCAP (or, the American Society of Composers, Authors and Publishers), to talk to him about his unexpected career turn and his pivotal role in shaping Daft Punk’s comeback. Mike Ragogna: Paul. We meet again! 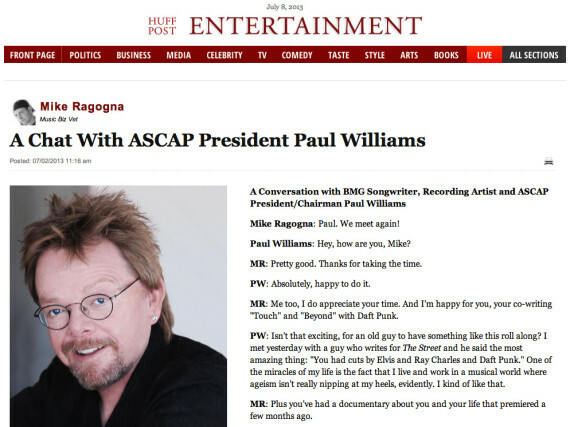 Paul Williams: Hey, how are you, Mike? MR: Pretty good. Thanks for taking the time. PW: Absolutely, happy to do it. MR: Me too, I do appreciate your time. And I’m happy for you, your co-writing “Touch” and “Beyond” with Daft Punk. PW: Isn’t that exciting, for an old guy to have something like this roll along? I met yesterday with a guy who writes for The Street and he said the most amazing thing: “You had cuts by Elvis and Ray Charles and Daft Punk.” One of the miracles of my life is the fact that I live and work in a musical world where ageism isn’t really nipping at my heels, evidently. I kind of like that. 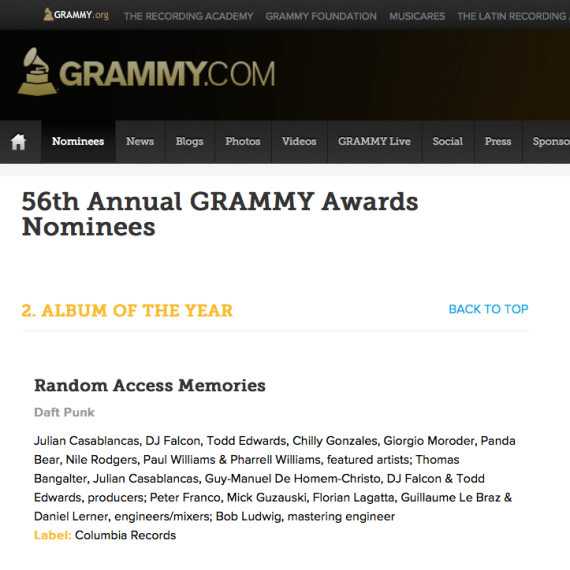 Led by Daft Punk at No. 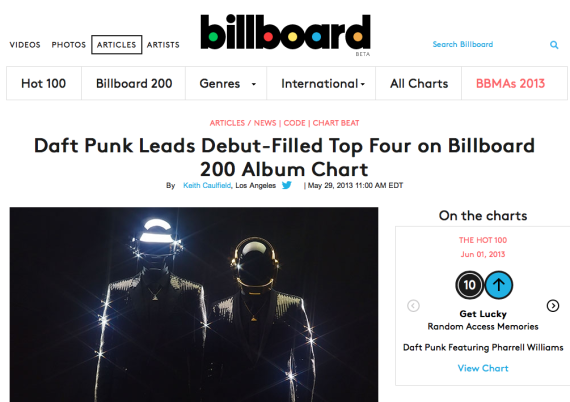 1, the entire top four on the Billboard 200 albums chart are debuts this week. The dance/electronic duo sees its new “Random Access Memories” launch at atop the tally with 339,000 copies, according to Nielsen SoundScan. As reported last night, it is the second-largest sales week of the year for an album. Daft Punk’s eagerly anticipated new album Random Access Memories is out and the reviews are in. The album debuted #1 on the U.K. and Australian album charts this week. 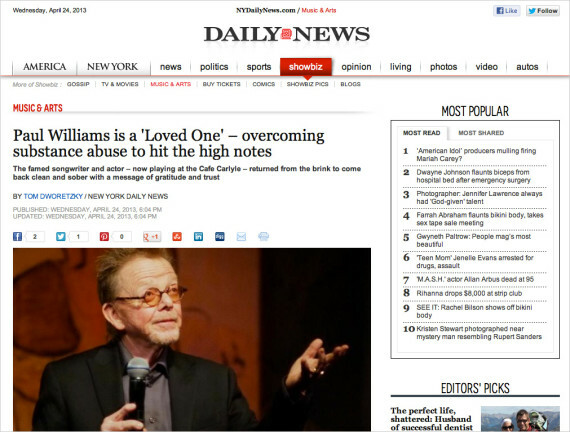 Below are review excerpts featuring Paul Williams’ contributions – “Touch” (lyrics and vocals by Paul) and “Beyond” (lyrics by Paul). 3 out of 4 stars – “Even more audacious is ‘Touch,’ which sounds like Daft Punk’s answer to ’70s schlock epics such as ‘MacArthur Park’ or an Andrew Lloyd Webber musical score. It’s even got Paul Williams, the septuagenarian auteur behind hits for the Carpenters, Three Dog Night, Helen Reddy and Barbra Streisand. Williams plays a ‘tourist in a dream’ amid a shifting array of musical backdrops – funk guitar, noodling synthesizers, disco kick drums, classical strings, drifting-asteroids ambiance. Rolling Stone also picked the best 8 Daft Punk songs ever of their 20 year career and “Touch” was number 8. “Phantom of the Paradise is key to understanding Daft Punk’s aesthetic. In the movie, a nerdy songwriter is reborn as a phantom who attempts to exact revenge on an evil svengali record producer named Swan. In one scene in the movie, Swan traps the phantom—now wearing a tight black leather jacket and a robot helmet—in a sophisticated recording studio walled with racks of analog gear. The phantom, whose vocal cords have been destroyed, speaks through a talk box attached to his chest, sounding remarkably like a vocodered lyric in a Daft Punk song. It’s easy to see why the rock opera was catnip for Daft Punk, who claim to have watched it more than 20 times—the movie is completely over-the-top, drenched in pathos, and layered with in-jokes and sideways references, much like the band’s music. I have gotten to notice the tell tale signs that a wonderful emotional musical evening is in progress. Look at the couples. There was lots of hand holding last night at Cafe Carlyle. Did you ever wish that Irving Berlin or Ira & George Gershwin, or Sammy Cahn were playing the Carlyle and you were in the audience as they performed their own music? Never mind the fact that they are not exactly gifted singers. You probably would have had one of your most memorable music happenings. 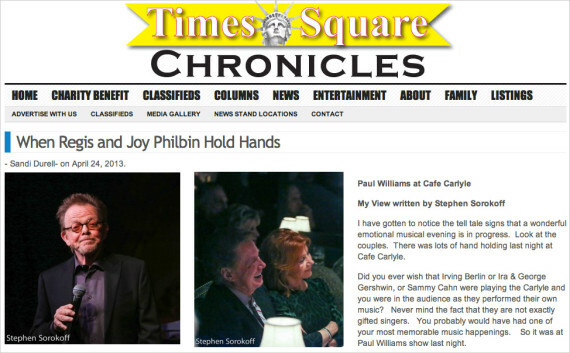 So it was at Paul Williams show last night. When Paul Williams and Charles Fox were invited in the late 1970s to write the theme song for “The Love Boat,” Mr. Williams recalled during his opening night at the Café Carlyle last Tuesday, they took it to the singer Jack Jones expecting the television series to last for four episodes at most. Little did they know that it would continue for a decade and that the tune “The Love Boat” would become a staple — and running joke — of Mr. Jones’s shows. A garrulous storyteller with a self-deprecating air and a keen sense of the absurd, Mr. Williams is a much more complicated person than his lyrics, even the sadder ones like those for “Rainy Days and Mondays,” let on. 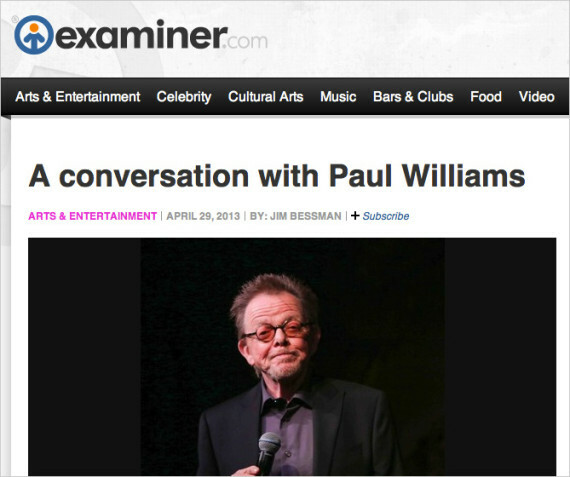 Everything Paul Williams says is either funny or memorable—or both. This became clear when the legendary songwriter (“We’ve Only Just Begun,” “Rainbow Connection,” “Evergreen”) ordered breakfast yesterday at the Carlyle Hotel, where he begins his second of two weeks tomorrow night at the Café Carlyle, and was immediately interrupted by fans who came down from Canada to see Saturday night’s show. “I’ve had relationships that didn’t last this long!” he said to the couple after posing for a pair of pictures, not at all bothered—busy as he is. Now famously sober after years of alcohol and drug addiction, the Los Angeles-based president and chairman of the American Society of Composers, Authors and Publishers (ASCAP) is in the middle of a career roll, what with the release of the DVD of his acclaimed documentary Paul Williams Is Alive, his acceptance May 15 of the 2013 Caron Artist Award (the benefit gala at Cipriani 42nd Street in New York provides financial assistance for alcoholism and drug addiction treatment), book and musical projects, and continued songwriting, in addition to performing—and blogging. 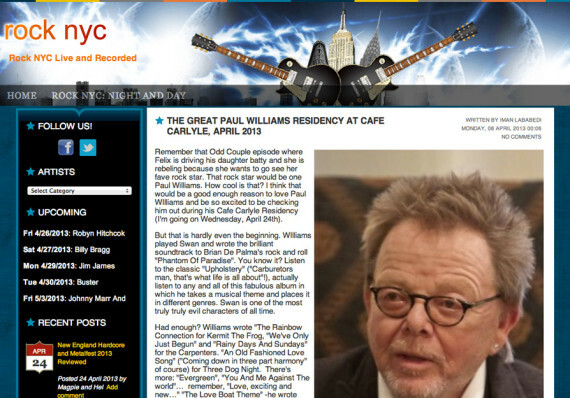 The Carlyle, A Rosewood Hotel presents award-winning lyricist and composer Paul Williams for an exclusive two-week engagement, and his debut, at the legendary Café Carlyle. Mr. Williams presents his newest program, The Lovers, The Dreamers, And Me, through Saturday, May 4th. Check out photos from his opening night below! April 24, 2013: The famed songwriter and actor – now playing at the Cafe Carlyle – returned from the brink to come back clean and sober with a message of gratitude and trust. Paul Williams says he has lived a blessed life and is grateful. Not so much because of his many successes as an actor, singer and songwriter – but because he has been given a second chance. You wouldn’t know his troubles from screaming headlines, though. Williams was lucky to have never became tabloid fodder. “The fact is I did rehab twice and was never ‘outed’ by the press,” he says. “By the time I got sober I was hardly the high profile performer I’d been,” he continues. He had somehow managed to keep it under wraps, at least in public at the height of fame. “I did ‘The Tonight Show’ with Johnny Carson forty-eight times. I remember six!” he confesses. He managed to pull out of the nosedive that claimed so many talents back in the 80s. April 24, 2013: So where did I go? 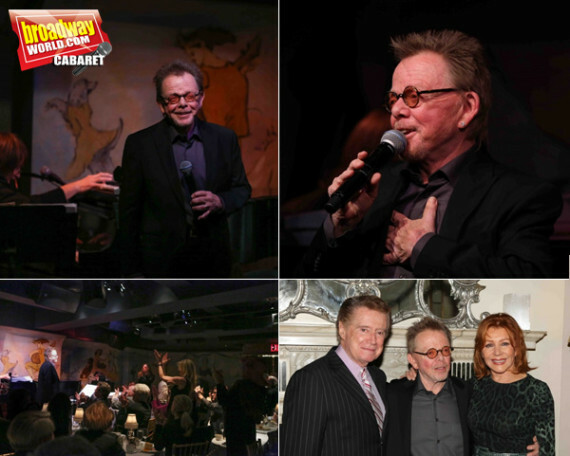 Over to the Café Carlyle for the opening night of Paul Williams’ cabaret evening. This is the place. Williams who was really famous in the 70s and 80s as singer, songwriter and actor, went away from the scene for awhile, caught up in his own torpor of self and success that Show Business often provides along with the glory. Last year, a new documentary about the man, by Stephen Kessler, called “Still Alive” debuted: Paulwilliamsstillalive.com. And now, the man has returned to performing with a brilliance that only time and life can endow. Williams was prolific, writing a lot of what are now standards. When you hear them again, your whole demeanor transforms (mine did anyway) on the spot. This is what a perfect cabaret act in New York should be. And it got the perfect audience response. Applause Applause. From the moment he takes the stage and introduces “the real Paul Williams” to his audience you’re back in the comfort zone of your own youthful moments of energetic reverie. April 24, 2013: Remember that Odd Couple episode where Felix is driving his daughter batty and she is rebeling because she wants to go see her fave rock star. That rock star would be one Paul Williams. How cool is that? 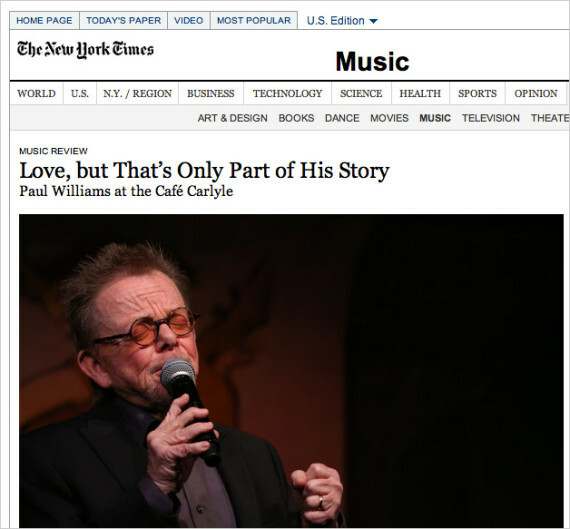 I think that would be a good enough reason to love Paul WIlliams and be so excited to be checking him out during his Cafe Carlyle Residency (I’m going on Wednesday, April 24th). But that is hardly even the beginning. WIlliams played Swan and wrote the brilliant soundtrack to Brian De Palma’s rock and roll “Phantom Of Paradise”. You know it? Listen to the classic “Upholstery” (“Carburetors man, that’s what life is all about”! ), actually listen to any and all of this fabulous album in which he takes a musical theme and places it in different genres. Swan is one of the most truly truly evil characters of all time.